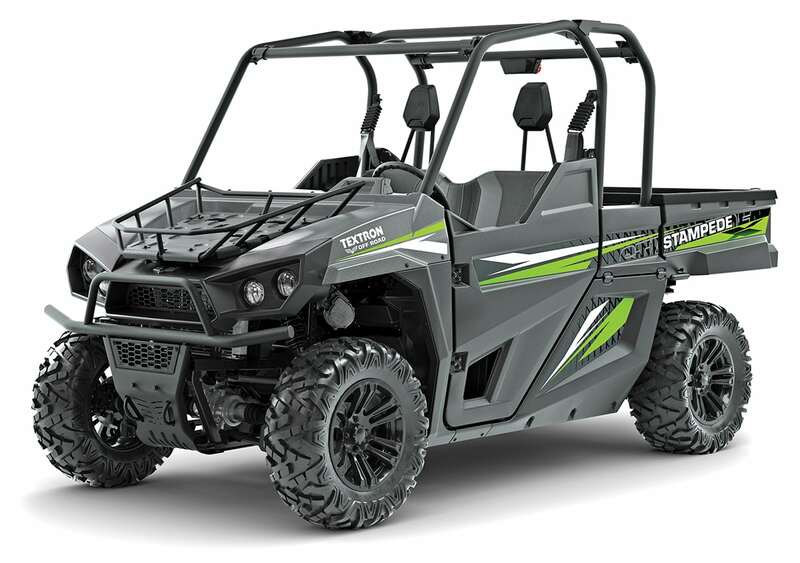 Textron’s Wildcats, Stampedes and Prowler return for 2019 with lower prices on many models, striking new colors and new Stampede Hunter Editions. There are no mechanical upgrades to this wave of sport models, but there’s more on the way from Textron, so stayed tuned for updated info as it comes in. 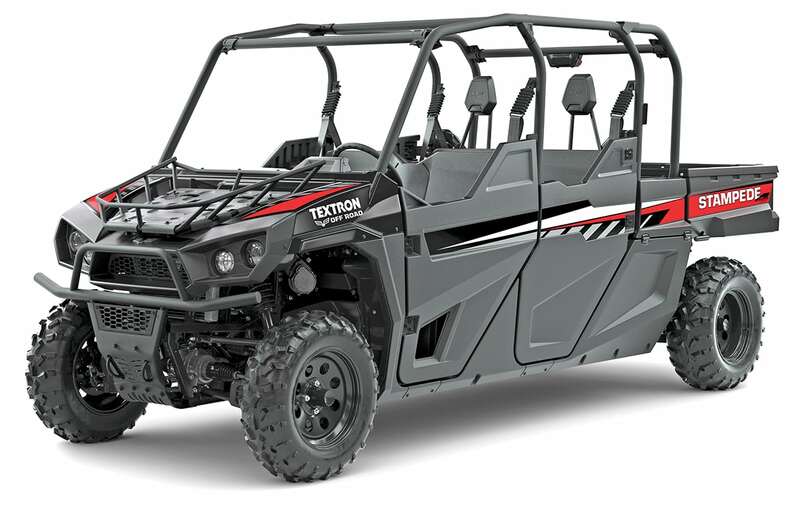 Here’s what you need to know about the first wave of 2019 Textron UTVs. The 2019 Wildcat X wears a new Charcoal Metallic and orange color scheme. Wildcat X LTDs come in new Charcoal Metallic with lime/blue-painted bodywork. The four-seat Wildcat 4X LTD is discontinued for 2019. 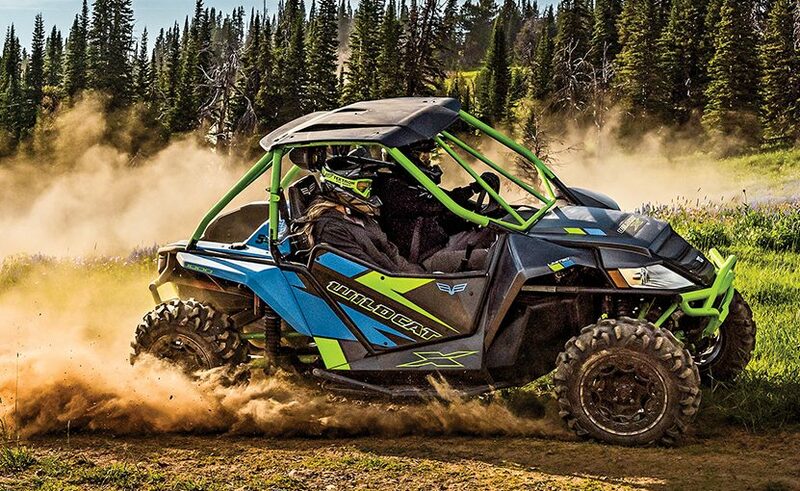 Wildcat X and Limited sport UTVs are powered by a 951cc, single-overhead-cam, eight-valve V-twin. Wildcat X suspension has 17 inches of travel up front and 18 in the rear using JRi compression adjustable shocks. Fully adjustable Elka Stage 5 shocks come on the Wildcat X LTD. The Wildcat X has Duro PowerGrip tires, cast-aluminum wheels and half doors. It’s $15,999, a thousand dollars less than last year. 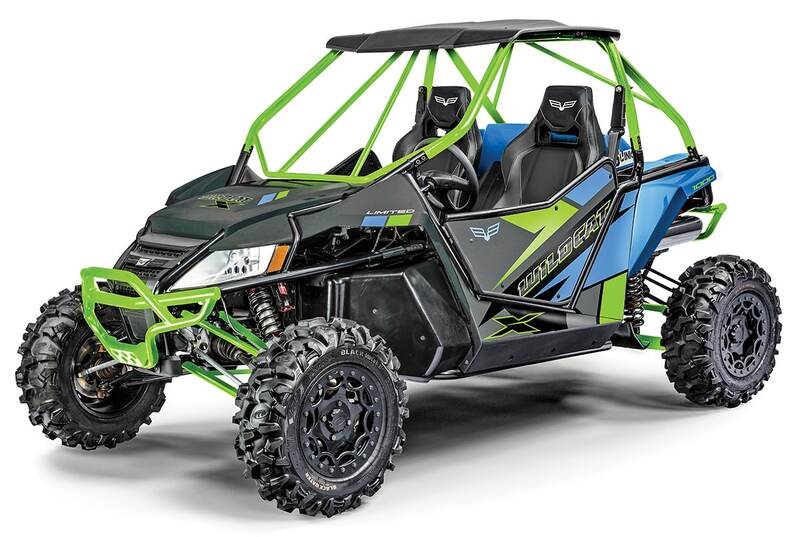 Limited models add a race-inspired cage with intrusion bars, full aluminum doors, a molded roof, beadlock wheels, aluminum front and rear bumpers and 27-inch ITP Blackwater Evolution tires. The Wildcat X LTD is $17,499, $1000 off last year’s price. The Wildcat Sport XT and Wildcat Sport LTD are 60-inch-wide sport models powered by 700cc, double-overhead-cam, eight-valve twins. Double-A-arm suspension provides 12.2 inches of travel up front and 12.6 inches in the rear. Both models have front and rear sway bars for flat cornering. Wildcat Sport XTs come with JRi ECX-1 compression-adjustable gas shocks, cast-aluminum wheels and half doors. 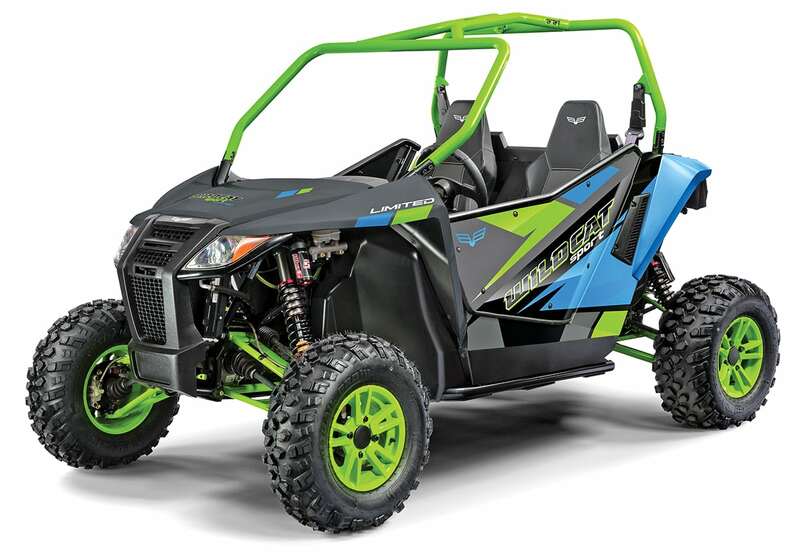 The Wildcat Sport XT is available in Earth Blue with Lime Green for 2019 for $14,599, $1100 of last year’s price. The Sport Limited gets Elka Stage 5 shocks with adjustable dual-speed compression and rebound damping, full aluminum doors, color-matched suspension arms, cage, aluminum wheels, and a 3.2-gallon under-hood storage box. It’s available in Charcoal Metallic with lime/blue for $14,999, $1000 less than last year. 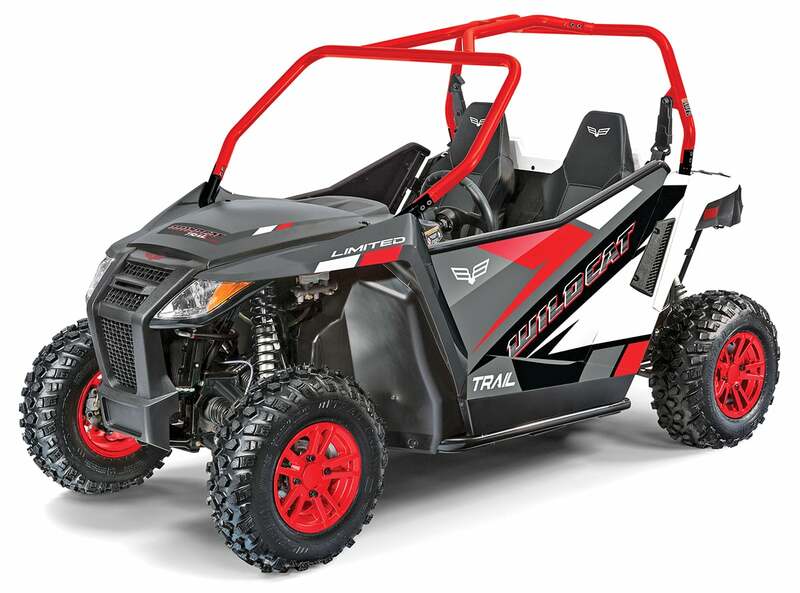 Wildcat Trail models are 50-inch-wide sport machines powered by the same 700cc, double-overhead-cam, inline-twin engine as Wildcat Sport models. They have double-A-arm front and rear suspension with 10 inches of front suspension travel and 10.5 inches out back. The base Wildcat Trail comes with steel wheels and half doors, and is available in black with orange for $11,499, $500 less than last year. 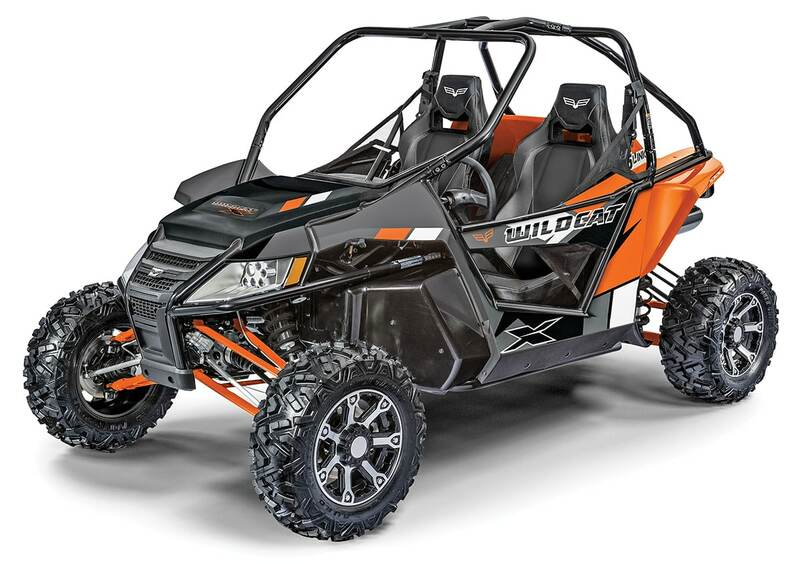 The Wildcat Trail XT comes with electronic power steering (EPS), cast-aluminum 12-inch wheels and half doors for $12,499. It comes in Earth Blue with Lime Green. The Wildcat Trail Limited includes all the XT package upgrades, plus full doors, under-hood storage, and color-matched aluminum wheels for $13,499. It’s available in Charcoal Metallic with Fire Red. 2019 Wildcat Trail XT and LTD prices are the same as 2018. 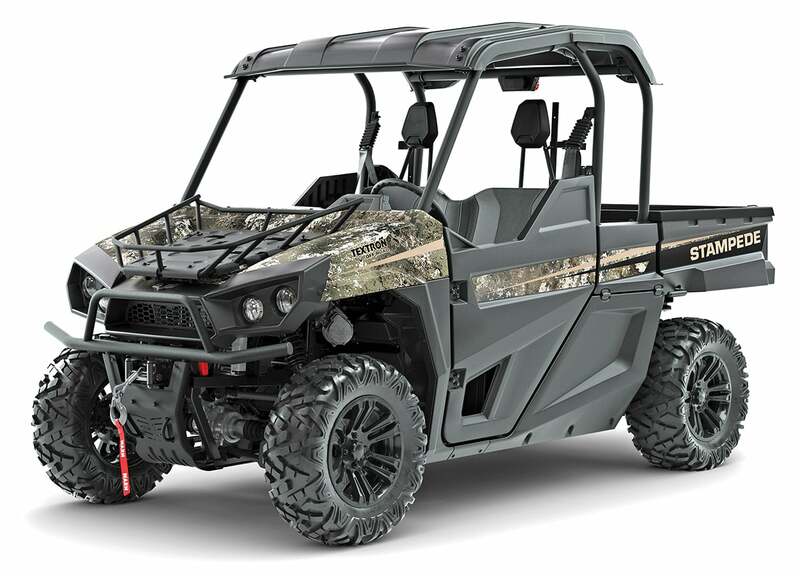 New for 2019, the Stampede Hunter Edition and four-seat Stampede 4 Hunter Edition come with a Warn winch, two gun mounts, roof, a hood rack, texture painted bumper and cage, and camo bodywork. The hood rack and texture-painted bumper and cage is new on all 2019 Stampedes. Stampede recreation utility UTVs are powered by 80-horsepower, 846cc, single-overhead-cam inline twins. A programmable speed controller allows the operator to set a maximum top speed from 26 to 55 mph. Stampede and Stampede X two-passenger vehicles and the four-passenger Stampede 4 and 4X have tilting beds that can carry 600 pounds. All models also have an extended cab that provides a cargo area separate from the bed. Roomy cabs, contoured seats, full doors, power steering and long-travel suspension add comfort on all models. The new Stampede Hunter Edition is $16,999. The Stampede Hunter 4X is $18,199. Base models come with black steel wheels, Kenda tires and Jet Black with Earth Blue or black with Fire Red bodywork. The Stampede is $14,499 and the Stampede 4 is $15,699. The Stampede X and 4X get 27-inch Maxxis Bighorn 2.0 tires, aluminum wheels, colored shock springs, color-accented bench seat, and Charcoal Metallic with Lime Green bodywork. The Stampede X is $15,499. The 4X is $16,499. 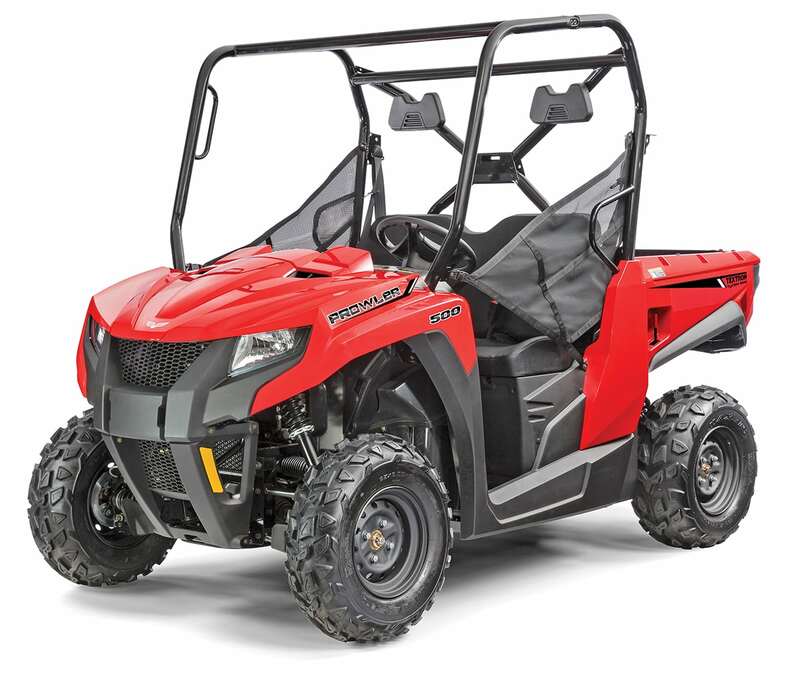 Textron’s Prowler 500 is a compact, affordable recreation utility machine powered by a 443cc, single-overhead-cam, four-valve engine. The tilting bed holds 500 pounds, and the machine can tow 1500 pounds. Independent front and rear suspension features spring preload-adjustable shocks. The dual-range, fully automatic transmission includes selectable 2WD/4WD and front differential lock. It’s available in Marsh Green or Performance Red for $8499.